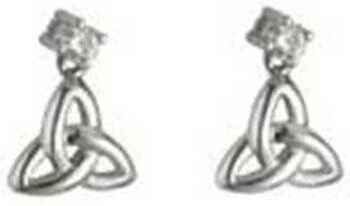 Celtic drop earrings are crafted in 14K white gold and feature Trinity knots along with CZ stones in the posts. These 14K white gold Celtic earrings are a drop style on posts, with push on butterfly backs, that feature Trinity knots along with a CZ stone incorporated into the front of the posts. The Celtic drop earrings measure 3/8" wide x 1/2" tall. Celtic drop earrings are crafted in 14K gold and feature Trinity knots along with CZ stone accented post fittings. Celtic necklace is cast in 14K white gold and features a succession of CZs that is completed with a Trinity knot.